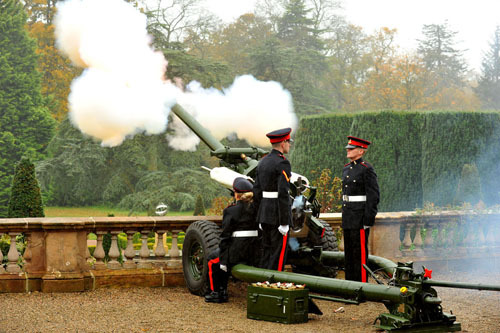 SOME of the ‘big guns’ of education were guests at Hillsborough castle recently as Northern Ireland officially marked the birthday of the Prince of Wales with a celebratory 21 Gun Royal Salute. As guests of Northern Ireland’s Reserve Forces and Cadets Association, the educationalists were invited not only to enjoy the traditional ceremony, but also to hear more about the Cadet movement and its contribution to the personal and educational development of some 4,000 members across the Province. 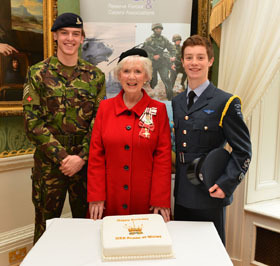 Pictured in the elegant setting of Hillsborough Castle about to enjoy a slice of the birthday cake specially prepared to mark Prince Charles’ birthday with Mrs Joan Christie, Her Majestyâs Lord Lieutenant for the County of Antrim, are (left), Cadet Staff Sergeant Edward Rusk of the Down High School Army Cadet Force Detachment and Cadet Warrant Officer Matthew Stewart from the Ballynahinch Air Training Squadron. Welcoming representatives from the education sector, Colonel Johnny Rollins MBE, Chief Executive of the Reserve Forces & Cadets Association Northern Ireland, paid tribute to the support given to Cadets by schools and colleges around Northern Ireland. He said: “Generations of young people have benefited from membership of the Cadet movement and its blend of adventurous fun, camaraderie and self-discipline is well known and, indeed, highly respected. “Those key elements remain as relevant and popular as ever, but the Cadet movement also keeps pace with changing priorities and, in partnership with educationalists, we have developed a range of important opportunities for our Cadets to earn internationally recognised qualifications and, more broadly, to enhance their CVs as we help prepare them for adult life.